As we make stained glass front doors for our customers, we try to put meaning and character into every piece. It might be an image of a favorite flower, a customer’s family crest, or simply the colors of their garden. Whatever it may be, it is symbolically significant to our customer. Stained glass windows from any era are rife with symbols and images, each with their own meaning. Symbols have been laced into stained glass for centuries. Their extensive use in churches throughout Medieval Europe made stained glass an important part of any church service. Until recent history, literacy rates have been very low, and stained glass served as the “Bible of the poor,” for those who could not read the Bible’s texts themselves. Instead, the illiterate relied on the spoken interpretation of the Bible, and the images presented on the stained glass windows above them. 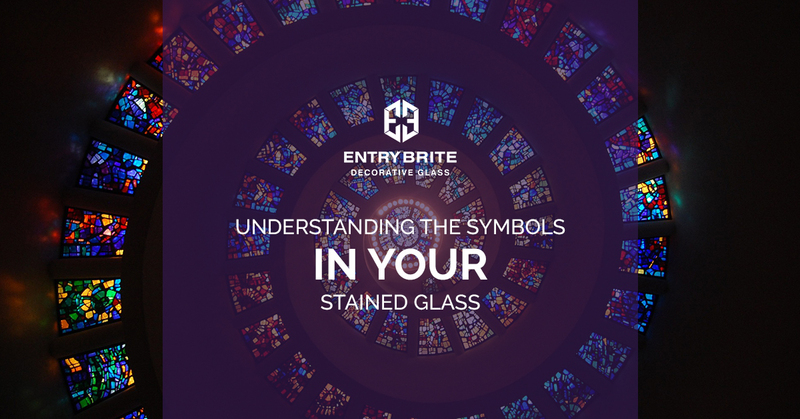 While the meanings of these stained glass symbols may feel veiled at first, you can quickly begin to understand them by looking for these distinct elements. When looking at a piece of stained glass art, be it in a church or elsewhere, look at the size of the images and elements. For instance, if the stained glass depicts a gathering of people, and one figure seems to be significantly larger than the others, this likely means that this individual was someone of great importance. 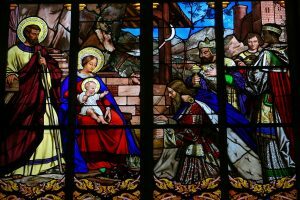 It’s not uncommon to see holy figures, monarchs, or even wealthy individuals being exaggerated in scale in stained glass artwork. Much like size, the position of an image or element in the stained glass art is a measure of its symbolic importance. Elements and images that are at the bottom of the stained glass are of limited importance. Those that are elevated in the image or are positioned high above the other elements are of great importance. In many examples of religious stained glass, often it is some sort of holy figure that is elevated above all others to communicate their heavenly status. We discussed color psychology in a previous blog post, but in case you missed it, color plays an important role in presenting and understanding the images within a stained glass piece. While in some pieces, colors can have any number of meanings, in religious stained glass, color plays a very particular role in communicating a symbol. For instance, blue is meant to represent heaven and the love of God, as well as the Virgin Mary. Green symbolizes springs, renewal, and the triumph of life over death. White and gold represent the innocence of a soul and the holiness of life. While the elements above will help you understand most of the meaning behind a piece of stained glass art, there are also some symbols that are less obvious. The light that filters through the glass itself is an important part of the meaning and weight of a piece of stained glass art. The light is meant to remind us of the inner light within ourselves. The glass itself is also a symbol. Its fragile nature, means that without care, the glass and our lives can be broken easily. Understanding the symbols of stained glass is a nuanced practice. While the ideas we presented on our blog may be spot on for some works, they might completely miss the mark for others. The symbols within a piece of stained glass art are influenced as much by the idea and the materials as by who made the piece in the first place. We hope you enjoyed the blog post, and if you’re looking to introduce stained glass into your home, make sure to visit our gallery page and contact us to ask about our home entryway remodeling services.